One of the most famous waterfalls of Kerala, Vazhachal Falls is situated on the Chalakudy River. The river originates in the upper reaches of the Western Ghats and the waterfall marks the start of the Sholayar range. The 120 m, almost 390 ft waterfall is a blessed sight. Vazhachal is set 5 km away from the mighty Athirapally waterfall. It is situated at the entrance to the Sholayar ranges. The waterfall is close to dense green forests that are home to many endangered and endemic species of flora and fauna. This is the only place in the Western Ghats where four endangered Hornbill species are seen. The Vazhachal fall is more of a gradual flowing waterfall. The swift waters crashing through the canyons offers a view what you would describe picturesque as. The area adjoining the waterfall is a restful escape from the hectic pace of life. The gardens surrounding the waterfall is full of medicinal herbs. They are known to have therapeutic effects on blood pressure, skin diseases and arthritis. Don’t forget to visit the Moolika Vanitha Swasraya Samithi, where you can get some exquisite samples of herbs, honey and herbal soaps at reasonable price. Vazhachal area is a great picnic spot. 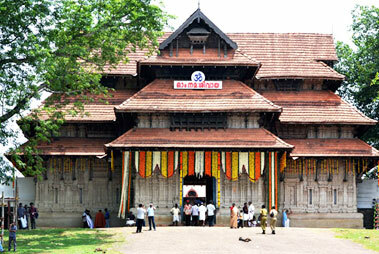 Families, couples and all visitors in Thrissur cannot afford to visit this magical spot. Spend a day at the falls. The thundering roar of water and the bliss of nature create a wonderful outing.